Saturday, April 13, 2013. My boyfriend suggested VIA Italian Table in Worcester, Massachusetts, for our Saturday night dinner after he saw it on Phantom Gourmet. I hadn’t heard of the restaurant, but then again I haven’t spent much time around Worcester. I was game. We didn’t have a reservation, but we arrived early at 5 pm. This is our standing strategy for weekend dinners: To avoid a wait, we can either make a reservation or show up early. The latter usually works and it did here, and we were immediately seated in a sunny enclosed patio. VIA is across the street from the One Eleven Chophouse; both are owned by the Worcester Restaurant Group, along with the a third restaurant that I’ve heard good things about, the Sole Proprietor. All dinners come with the insalata mista (mixed greens and house vinaigrette). I told the waitress I was vacillating between two options: the asparagus, toasted walnut, and goat cheese salad (additional $4); and the burrata caprese salad (additional $5). On her advice, I went with the burrata caprese salad and was happy I did so. The salad consisted of fresh buffalo-mozzarella burrata, tomato, finely chopped basil, balsamic reduction, and a small pitcher of extra-virgin olive oil. Burrata caprese salad: fresh buffalo-mozzarella burrata, tomato, finely chopped basil, balsamic reduction, and a small pitcher of extra-virgin olive oil, at VIA Italian Table in Worcester, MA. 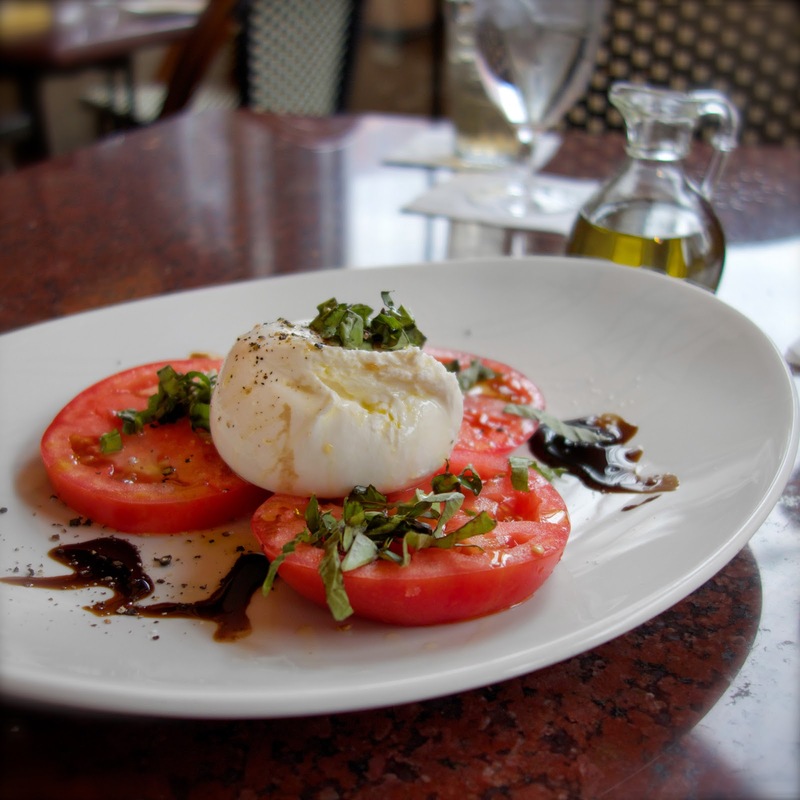 If you’ve never had burrata, you’re missing out on one of the best Italian dishes around. Burrata is a sack of mozzarella with a solid exterior shell and a soft mixture of mozzarella and cream on the inside. I first fell in love with this cheesy delight at Tomasso Trattoria in Southboro and have ordered it at just about every opportunity since. Luckily, VIA’s burrata did not disappoint! The waitress told me that the caprese salad had recently been changed from mozzarella to burrata—an excellent decision, in my humble opinion. The flavor was so rich. I kept commenting on how you could really taste the cream. The balsamic had strong sweet and sour notes, and I loved that the olive oil came in a small pitcher so I could pour on as much or as little as I liked. This is on my must-order list when I next return. Even before we arrived, my boyfriend had already pored over the menu and selected the ragu of Italian meats for his entree ($19.99): slow-roasted pork, beef, chicken, meatball, sausage, and fettucine. He was happy with his selection and finished the plate. Based on my bite of the juicy, flavorful meatball, I might order this dish on our next visit. 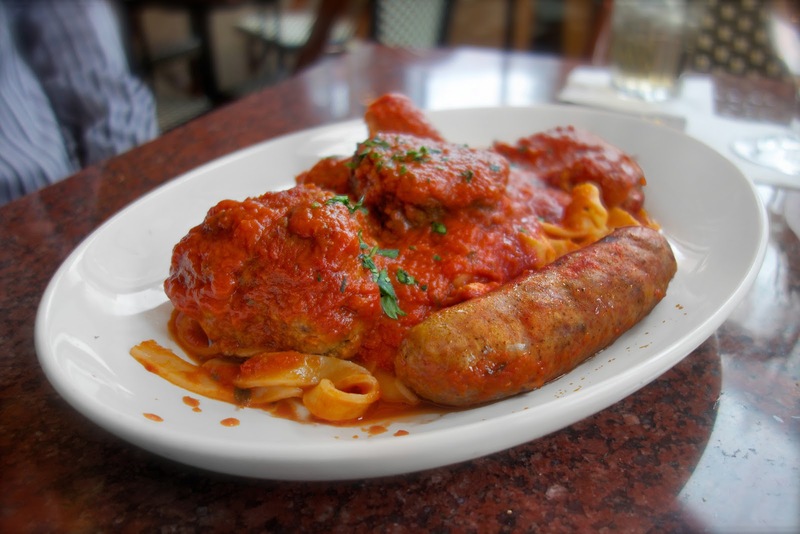 Ragu of Italian meats: slow-roasted pork, beef, chicken, meatball, sausage, and fettucine, at VIA Italian Table in Worcester, MA. I went with VIA’s specialty roasted suckling pig ($24.99), slow-roasted for twelve hours, served with roasted Tuscan potatoes and vegetables, finished with a rich pork reduction sauce. 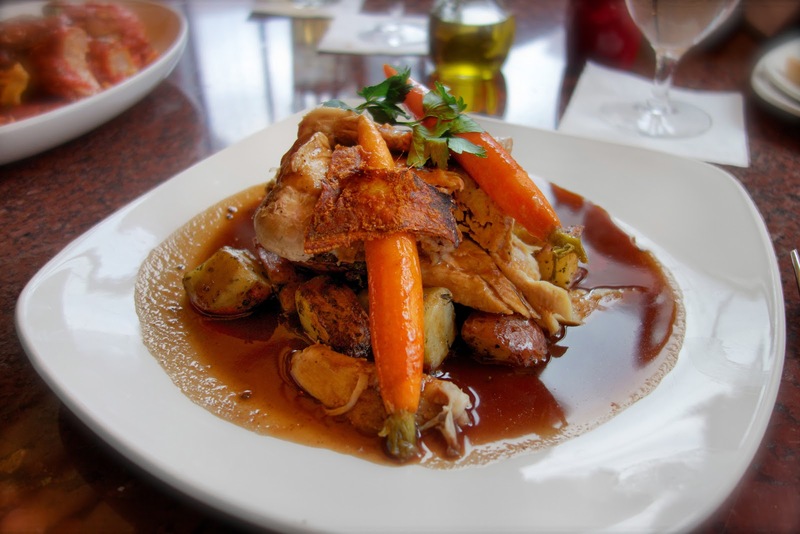 Roasted suckling pig ($24.99), slow-roasted for twelve hours, served with roasted Tuscan potatoes and vegetables, finished with a rich pork reduction sauce, at VIA Italian Table in Worcester, MA. My boyfriend had the first bite of my entree. The first word out of his mouth was, “Wow.” The pork was tender and juicy. The rosemary flavor in the potatoes was excellent, as were the well-cooked vegetables. And then there was dessert. VIA has a prominent “Gelato Story” section on its dessert menu, obviously proud of its gelato and sorbet made in an Italian Carpigiani gelato machine. I also noted that VIA employs a pastry chef. Few enough restaurants advertise a designated pastry chef that it stands out when I see it, especially in an Italian restaurant. My boyfriend ordered three scoops of the chocolate gelato ($8). Classic, simple, delicious. I didn’t interrogate him about the quality; he ate the whole dish and he’s finicky enough about ice cream to speak up if something isn’t up to par, so I didn’t feel the need. 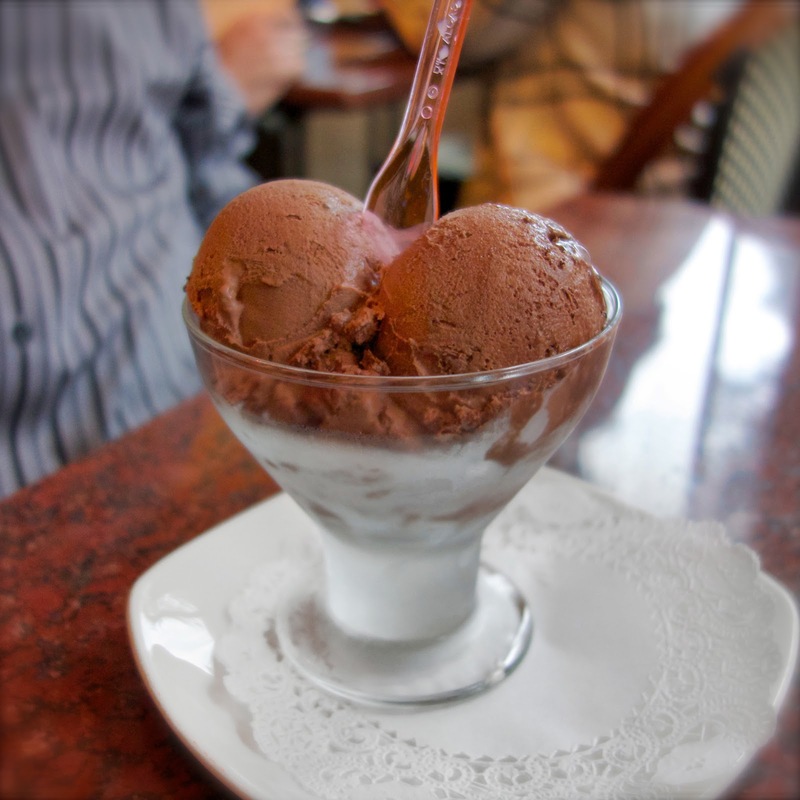 Chocolate gelato at VIA Italian Table in Worcester, MA. Besides which, I knew firsthand. Although tempted by VIA’s crepe cake I had opted for the spectacular “Michelangelato” sampler of miniature ice cream cones served on an artist’s palette. (As featured on Phantom Gourmet.) The sampler is available with five ($6) or ten ($10) mini ice cream cones. I am a slave to my insatiable sweet tooth and so, predictably, I ordered ten. The gelato and sorbet flavors included chocolate, chocolate chocolate-chip, limoncello, strawberry, raspberry, coconut, blood orange, pistachio, and two vanillas. 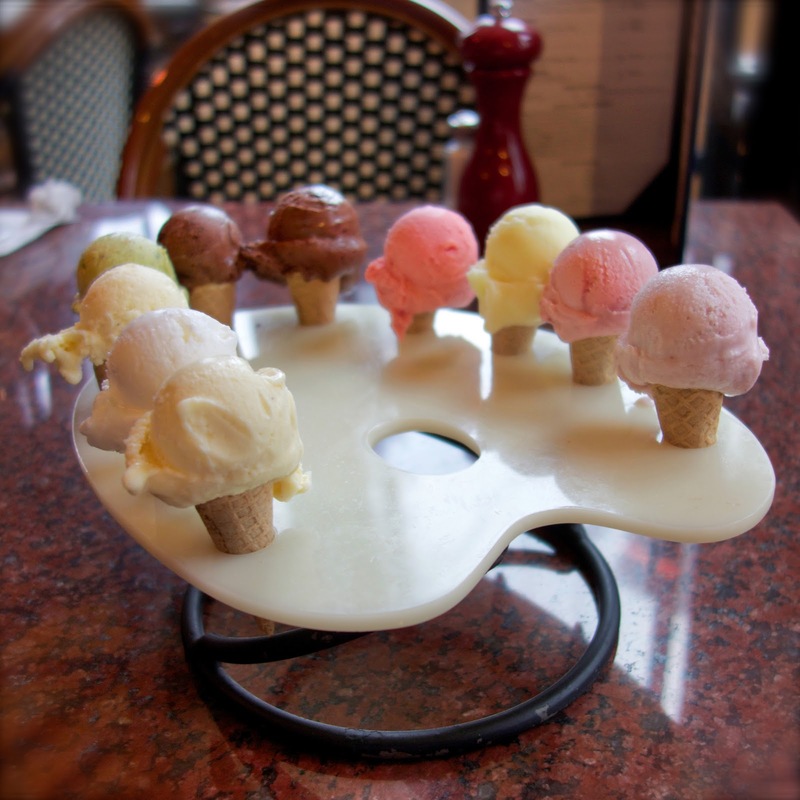 The “Michelangelato” sampler of ten miniature ice cream cones served on an artist’s palette, at VIA Italian Table in Worcester, MA. The fun of having ten mini ice cream cones made up for the challenge of keeping track of ten simultaneously melting scoops of ice cream. The coconut was bright, creamy, and tropical. The strawberry’s fresh flavor popped; it even had tiny strawberry seeds it in. The nutty pistachio had little pieces of pistachio. But it was the limoncello and blood orange that tied for my favorite. The limoncello tasted like lemonade, my all-time favorite drink. The blood orange looked pink and I didn’t know what to expect when I tasted it, but its tanginess won me over instantly. Based on our experience, I recommend VIA Italian Table to anyone in the Worcester area looking for Italian comfort food. Don’t pass up that burrata. I hope to return soon! Oh my gosh those tiny scoops of ice cream are so cute! I love Italian food. I had a burrata caprese recently too and it was delicious!